﻿ Matthew 7:13 "Enter through the narrow gate; for the gate is wide and the way is broad that leads to destruction, and there are many who enter through it. 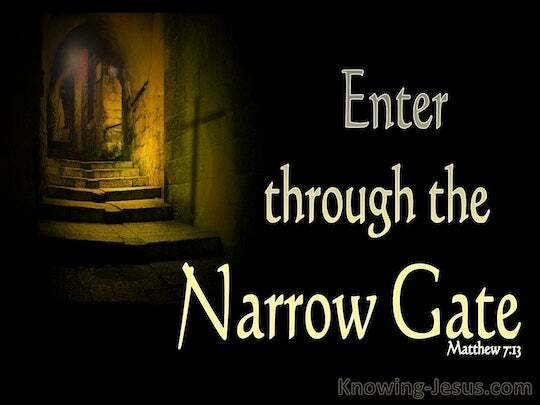 "Enter through the narrow gate. For the gate is wide and the road is broad that leads to destruction, and there are many who go through it. "Go in through the narrow gate, because the gate is wide and the road is spacious that leads to destruction, and many people are entering by it. Enter ye in by the narrow gate, because wide is the gate, and broad is the way, that leads to destruction, and many are they who enter through it. Enter through the narrow gate; for wide is the gate and spacious and broad is the way that leads away to destruction, and many are those who are entering through it. "You should enter [God's kingdom] by means of the narrow door, for the wide door and the broad road are the ones that lead to [spiritual and physical] destruction. And many people will enter [that wide door]. Enter in through the strait gate: for wide is the gate, and broad is the way, that leads to destruction; and many there are that go in through it. Go in by the narrow door; for wide is the door and open is the way which goes to destruction, and great numbers go in by it. "Enter by the narrow gate; for the gate is wide, and the way is broad that leads to destruction, and many are those who enter by it. Enter ye in at the strait gate; the gate that leadeth to destruction is broad, and the way is open, and they who pass through are numerous. Enter ye in through the narrow gate: because wide is the gate and broad is the way, that leadeth to destruction, and many there are, who are going in through it. "Go in at the narrow gate. For the road that leads to destruction is broad and spacious, and there are many who go in by it. Enter ye in through the strait gate, for broad the gate and spacious the way leading to destruction, and many are they coming in through it. Go in through the narrow gate, for wide is the gate and broad is the way that leads to destruction, and many there are who go in through it. 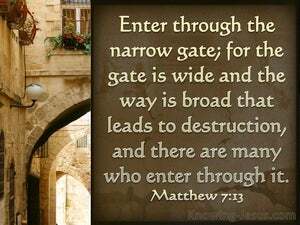 Enter by the narrow gate: for [the gate] is broad and the road is wide that leads to destruction, and many enter that way. "Enter through the narrow gate, because the gate is wide and the way is spacious that leads to destruction, and there are many who enter through it. Enter in at the strait gate; for wide is the gate, and broad is the way, that leadeth to destruction; and many are they who go in thereat. Enter ye in at the strait gate; for wide is the gate, and broad is the way, that leadeth to destruction, and many there are who go in by it. 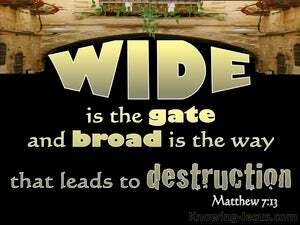 "Go in by the narrow gate, for broad and roomy is the road that leads to destruction, and many are going in by it. 12 "In everything, therefore, treat people the same way you want them to treat you, for this is the Law and the Prophets. 13 "Enter through the narrow gate; for the gate is wide and the way is broad that leads to destruction, and there are many who enter through it. 14 "For the gate is small and the way is narrow that leads to life, and there are few who find it.